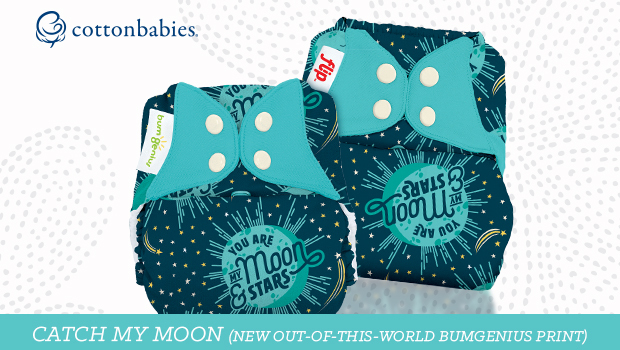 It’s sweet dreams with “My Moon” – our newest cloth diaper print! My Moon was created while thinking about the special moments you share with your little one at night. This print sings, “You are my moon & stars” with a color palette of dark blue, Mirror, Butternut, Noodle and White to inspire sweet dreams. My Moon is now available for pre-order in the following bumGenius and Flip styles at CottonBabies.com and many independent retailers. Shipping by 9/17/18. bumGenius Elemental cloth diapers in My Moon are coming soon! Have you ordered My Sun yet? You don’t have to wish on a shooting star, both of these out of this world prints can be yours! 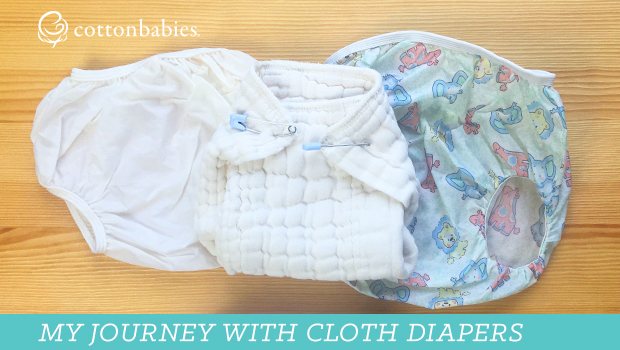 You’re not dreaming – we’re giving away a My Moon bumGenius cloth diaper! For an extra entry, tell us your favorite part of your little one’s bedtime routine. Eligible entries must be posted no later than 12:00 a.m. Central Time, September 25, 2018. U.S. residents only. Void where prohibited by law. No purchase necessary to win. Winners will be drawn after the close of the contest and notified via email. This promotion is in no way sponsored, endorsed or administered by, or associated with, Facebook. We hereby release Facebook of any liability. All prizes must be claimed within 30 days of the end of giveaway. Libby Fasnacht Libby is the marketing director for Cotton Babies. She's an obsessed auntie to three super fun kids. She loves coffee, chocolate, and singing Broadway show tunes. So many fave parts, we love reading books and snuggling! Can’t wait until our little one is born to use them. My favorite part of my baby’s bedtime routine is breastfeeding her to sleep while having our lavender essential oil in the air. We love to snuggle and read a book before bedtime! My favorite part of our bedtime routine is a massage! Singing baby beluga after bath time. Reading her a book is my fave part. My favorite part is his sweet look as he drifts off to sleep, completely peaceful and content. My favorite part about bedtime with my little 6 week old is the snuggle time while we rock in the glider after late night feeds. I love the colors in this pattern! I can’t wait to get My Moon to go with My Sun! My favorite part of bedtime is when the kids kiss my belly to say goodnight to their sibling due in March! So sweet! We read Goodnight Moon EVERY SINGLE night and I love all the “nigh nighs” that come. My favorite part is the snuggling and the nursing to sleep. My favorite part of bed time is when I middle child climbs into the rocker to snuggle with the baby and I during our bed time story. As he is getting bigger, he is less interested in snuggles, but I love the sweet moments before bed when he still wants to be held. I am so excited for these new prints. I’ve been a bg mama for the past 6 years and I’m ready for some new and exciting prints from BG. Reading together is my favorite part of putting the kids to bed. Bath time and story time are my favorites. My favorite part is snuggling them in the rocking chair before putting them in bed. My favorite part of bedtime is reading a story together and snuggling. I love that my little one wants to me to lay next to her while she settles down and drifts off.